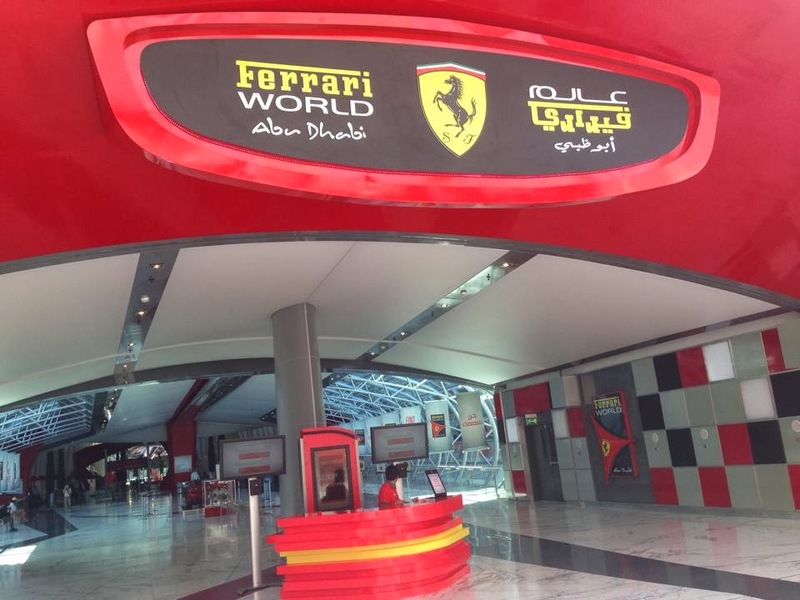 Ferrari World is a Ferrrari amusement park on YAS Island in Abu Dhabi. It is considered to be the largest indoor amusement park in the world. It officially opened in November 2010 and is home to Formula Rossa, the world's faster roller coaster at 240 km/hr. The iconic roof of Ferrari World was designed by Benoy architects. The central park is situated under a 200,000 sq. meters roof making it the largest in the world & has the largest Ferrari logo ever made. The centre of the roof is marked by a 100 metres glazed funnel. Formula Rossa- accelerate up to 240 km/hour in less than 5 seconds in a true F1 experience aboard the world's fastest roller coaster. Fiorano GT Challenge- Kump into a Ferrari F430 Spider as two competing GT coasters race to the finish line. Scuderia Challenge- Experience the ultimate state-of the-art racing simulators on a variety of Ferraris, solo or with a group. Bell'Italia- Enjoy a refreshing change of speed as you explore a miniature Italy, in a small-scale 1958 Ferrari 250 California. Made in Maranello- Cross the gates in Maranello and into a tour of the historicFerrari factory to see how a Ferrari is born. Driving with the Champion- Live the dream of the sitting shotgun with a racing champion in this motion-based simulator. Galleria Ferrari- Get up close and personal with the ultimate display of Ferrari cars, hailing from Maranello and top collectors from around the world. V12- Journey into the heart of a 12-cylinder Ferrari 599 engine in this exciting flume ride. Discover the Spirit of Abu Dhabi for an ultimate desert life experience. This was one awesome once in a lifetime experience to finally witness & experience the Desert Safari where you will truly experience the true desert of Abu Dhabi. We booked a half day safari tour for only 180 Dirhams by Sunshine Travel & Tours which I highly recommend for every dollar you spent was worth the experience. Out tour started at 3PM where tour service fetched us straight from our hotel & made our way for an exciting drive over the sand dunes. Watching the sunset from the dunes, visiting the camel farm & visiting an Arabic camp were just so amazingly memorable. Our journey continued in the Arabic camp where varieties of activities including henna painting, sand boarding, Shisha & the infamous belly dancing. After which, they served us with Arabic BBQ dinner as sunset started with local music for a night you will never forget & you will be treated to traditional Arabic hospitality with coffee & dates served as they have been foe centuries & continue to be served in Emirati home today. 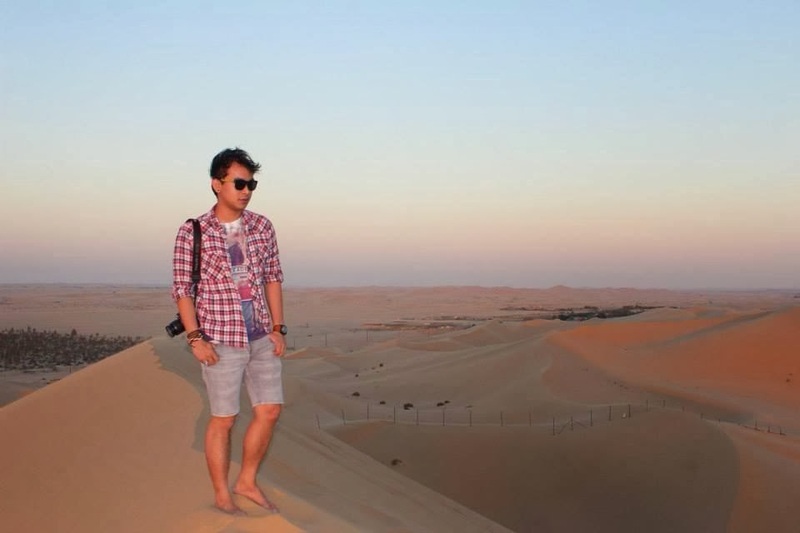 Top of the world at Al Khatim Desert during sunset. Ending up the year 2013 filled with more parties, travel escapades & memories to cherish forever. Now we're starting to write our own stories for the book of 2014. My mantra this year is to take vacations. Go as many places as I can. For you can always make money but you can't always make memories. 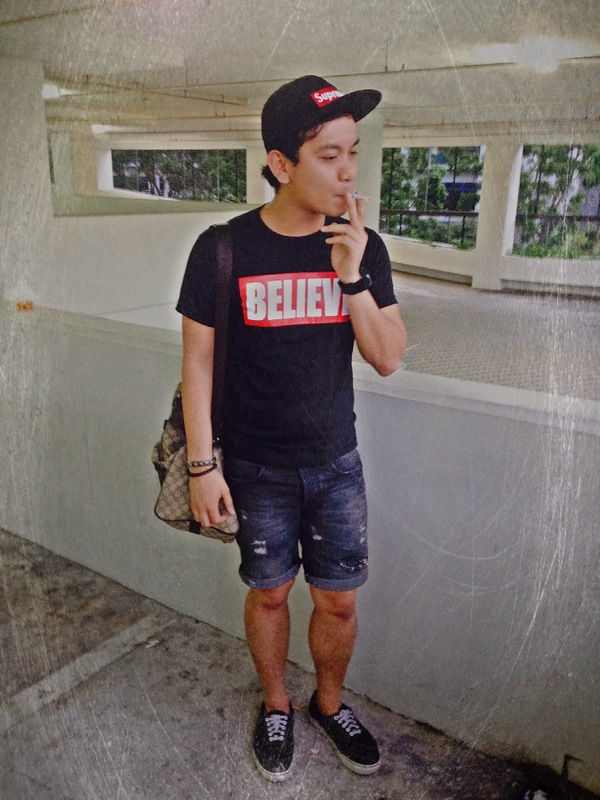 Believe x Supreme is another random fashion statement I came up with on a normal work day in Singapore. I just realised that my BELIEVE statement shirt & my SUPREME cap got a total matching style combined together. Throwing some fashion accent like Gucci bag & classic Vans sneakers will always be one great look. Simply experiment with your everyday style & you would always come up with great style for everyday fashion look. Starting to kick off 2014 with the best & unforgettable birthday celebration of my life. It’s always a triple celebration for me from Christmas to new year then my birthday as finale foe a long festive celebration. I’ve been celebrating my birthday in Singapore for 3 years now without my family but I’m lucky enough to have the best people here to always celebrate my birthday with me. I celebrated my actual birth date overseas & that’s the most unforgettable one that I had so far (private life) LOL! I also accomplished one of my bucket list of 2014 & that’s when I had a Bungee Jump exactly on my birthday, what about that? I came home around 11:50PM but was still surprised by the onerflowing gifts & surprises for me. I was supposed to celebrate it in chalet or hotel but it’s all fully booked so I just decided to have it done in my own humble place. Everything just went so perfectly from the pinoy food, unlimited liquors & awesome crowd who celebrated my birthday with me. What else would be so exciting other than their gifts? Oh well, nothing much to say but to be so thankful for all the love & gifts I received. Another year means new responsibility for me & looking forward for more travel, friendship, celebrations & life lessons this coming year. I love you guys! Want to know the latest fashion forecast for the top colors to wear this year? Let me give you details on the latest season color equilibrium to help you out on your shopping list must have colors to consider this year 2014. Most of the designers take modern twist on the traditional spring 2014 by pairing soft pastel colors with vivid bright shades to create a colorful ambience. This year is all about mixture of blooming floral patterns, overseas travel inspirations & use of colourful designs & vibrant fashion accessories to complete the look. Cayenne, a high-pitched red, adds a dash of spicy heat to neutrals, and heightens the excitement when mixed with Dazzling Blue, a scintillating, polar opposite to Placid Blue. Surprisingly, these strong, vibrant colors also pair well across the palette: They are perfect companions to pastel, and add confidence and vivacity when mixed with other bold colors. I got this look inspired by a picture of jovial color, clashing graphic patterns & design details with bold color linings. My Recoil top complements well with the Bershka shorts in creating the red-blue-white color combination. Pairing it up with Supreme cap, Ray-Ban sunnies & laid back loafers will totally complete the look for a super trendy colorful 2014 king of look. Get you creativity working with the colour-blocking of patters & graphic designs this year. Watch out for more fashion outfit post right here on my blog. Many of the most well-love fairy tales revolve around the plight of common men & women who, by lots of virtue and plenty of luck, climb out of poverty reaching goals once thought unachievable. 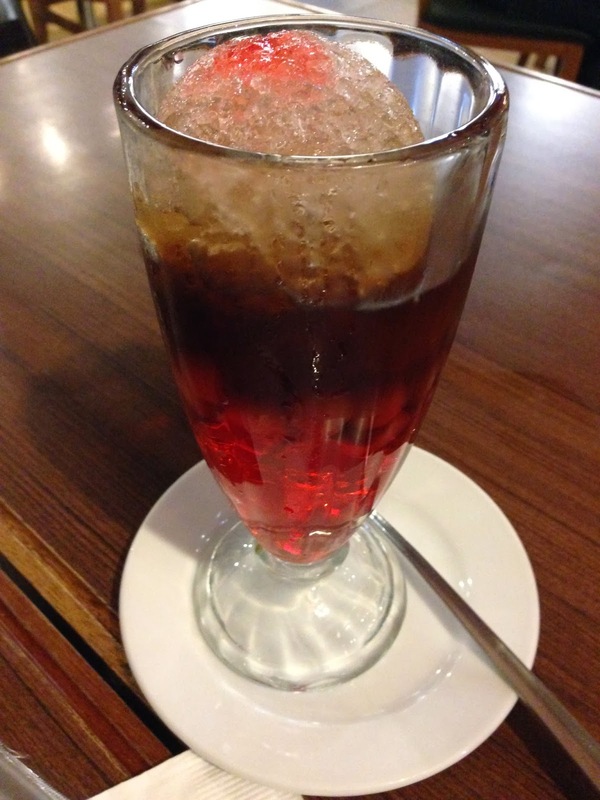 Such is the story of Alex & Engracia "Aling Asiang" Reyes, a simple hardworking couple whose small venture into the restaurant business 75 years ago allowed them to prevail over hardship and forever etched an indelible icon in the Filipino food industry- The Aristocrat. and fruit ice shaving, topped with purple yam, custard & rice puffs.